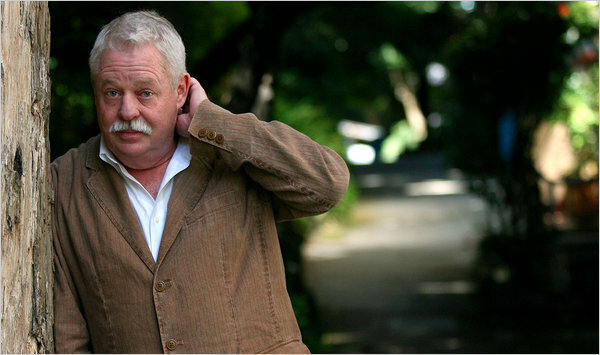 I was 16 when I first found Armistead Maupin’s ‘Tales of the City’ books in the library of my hometown, Sligo. It was the 1980s and I was being badly bullied in school. Utterly isolated in that narrow-minded, grey town, and having dark thoughts about ending my life, the books became an instant lifeline, revealing to me a world where gay people were not all derided stereotypes. They had straight and trans friends, they had plenty of fun and love in their lives, they weren’t self-hating, and they didn’t entertain other people’s hate either. In that sense, Maupin was a kind of Dan Savage-like character in my mind. His persona was just as important as the characters in his books, and his message to me, and to millions of other readers was, ‘it gets better’. I’m starstruck and a bit speechless. Not only was this man a huge influence on my journey towards coming to terms with myself, but he made me want to become a writer too, and here he is, all twinkling eye-contact and laughter, shooting the breeze in midst of the hustle and bustle of Dublin’s Shelbourne Hotel on a Friday after work. It feels unreal, but I only have a short time with him, so I soldier on. Back in 1978, when Tales of the City came out, was he aware of the impact it might have, I ask. “I knew locally that it was a force that was being felt,” Maupin says. “Michael’s letter in which he came out to his mother in that first book was specifically inspired by the Anita Bryant anti-gay campaign at the time – Save Our Children. A lot of us were coming out and letting our parents know who we were. I wrote that letter in 45 minutes, because I had been saving it up for at least 15 years. Maupin who turns 70 in May, is here to promote the latest and final installment in the ‘Tales of the City’ series, The Days of Anna Madrigal. In this book, as in the previous two, gay character Michael Tolliver (now in his 60s) grapples with the insecurites of growing older while married to Ben, who is significantly younger. It’s a marriage that reflects the authors’ own to 42 year-old Christopher Turner. “He’s 42 years old and he has whole other issues around career and everything else, that I don’t much have anymore. I remember what it was like to be 42, pushing ahead, wanting to achieve something important. Chris has achieved a number of significant things in his life, but sometimes we have different agendas. While Michael deals with ageing in the context of his relationship, I wonder if Maupin is saying anything about aging in the wider context of being a gay man. “I think it would be very bad form to complain about a process that most of my friends were denied,” he says. “I lost so many friends to Aids, and it saddens me profoundly that they aren’t with me now, still making this journey, so who am I to say, ‘Oh, poor me’. When Maupin arrived in this part of the world on his current mammoth book tour, he discovered that The Days of Anna Madrigal had hit number one on the London Times bestsellers list, while critics who have been divided about the ‘Tales’ series, have been unanimous in their praise. It’s a fitting end to the series, which sees the mysterious Mrs Madrigal, erstwhile landlady of 28 Barbary Lane, and matriarch of the ‘logical’ family made up of the ‘Tales of the City’ characters, confront painful secrets in her pre-transition past. Now 91 years old, Mrs Madrigal is also facing her own mortality, and in the final pages of the book, waves a triumphant goodbye in the midst of the Burning Man festival. I ask the author how it felt, after 36 years with her and all the other ‘Tales’ characters, to wave goodbye in return. Now that he has released himself from ‘Tales of The City’, Maupin has no immediate plans to write another novel (he did write two, Maybe The Moon and The Night Listener in between the sixth and seventh installments of ‘Tales’).